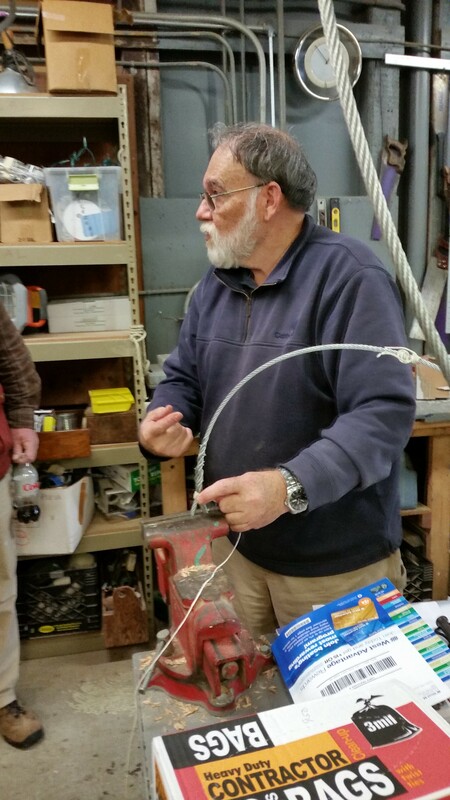 Bob Dollar of R&W Rope came to our shop to introduce us to the Liverpool Wire Splice. Books are helpful in the learning process, but something as complex as a Liverpool splice really needs a personal session to show the “art” in the task. 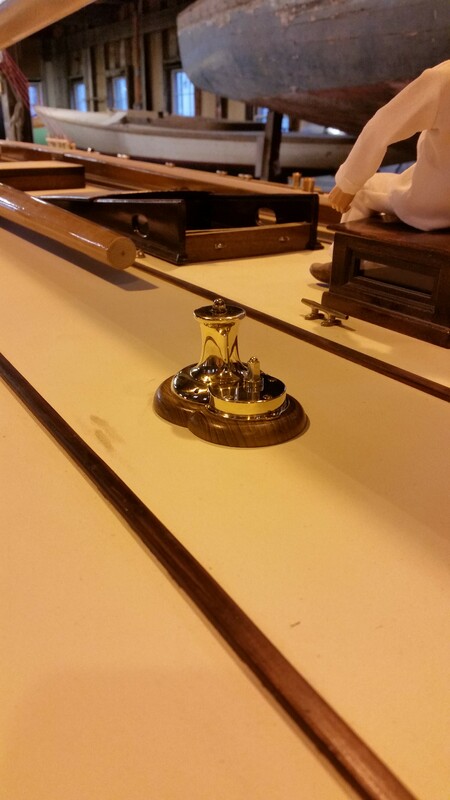 Bob told “Bosun” Herb that he’ll need to practice, so as you can see him practicing this new craft below. 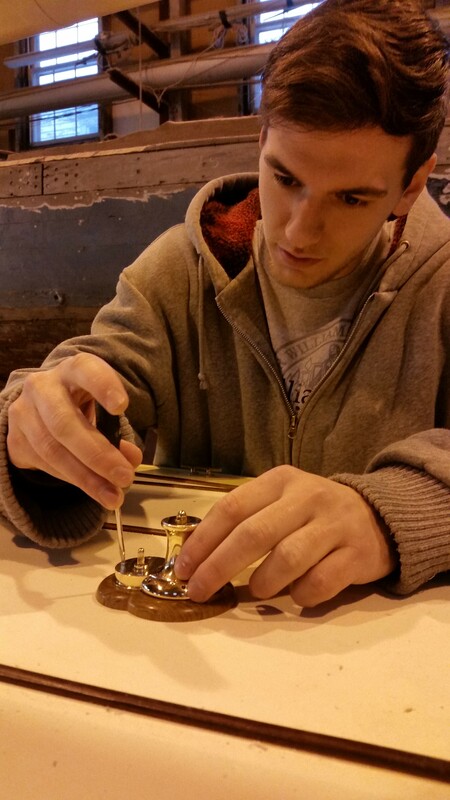 Meanwhile, Bill has been working on our very complex spreader assembly. 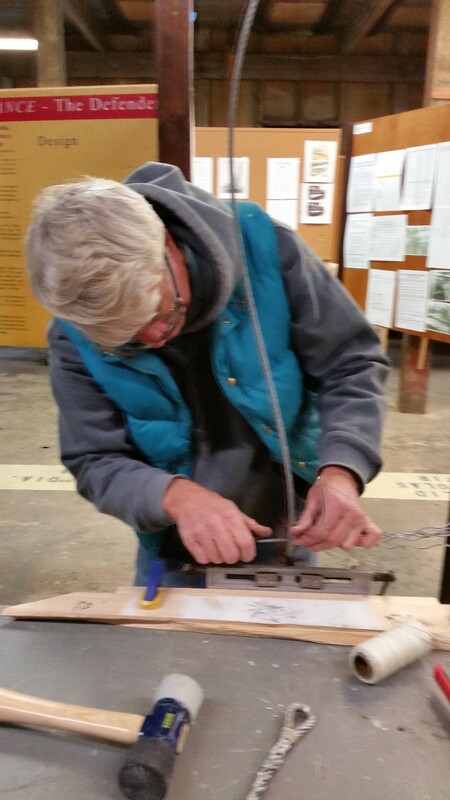 The inboard half of the Douglas Fir spreader is actually an I-beam and Bill is shown routing out the center section. 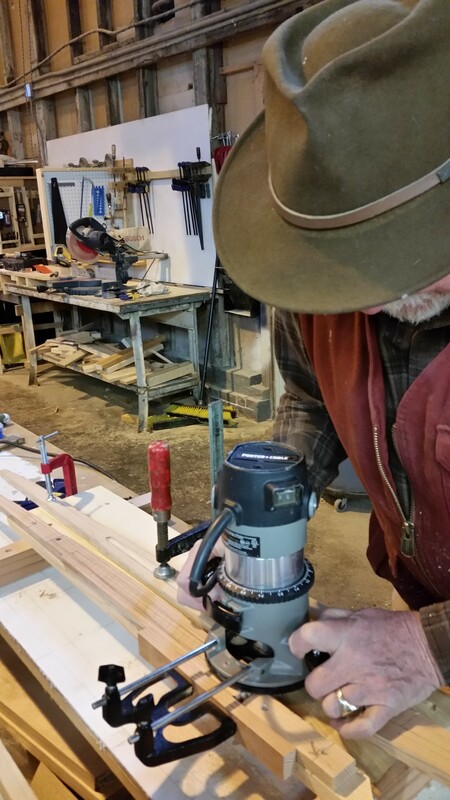 He’s using our first non-laminated spreader as a router guide. 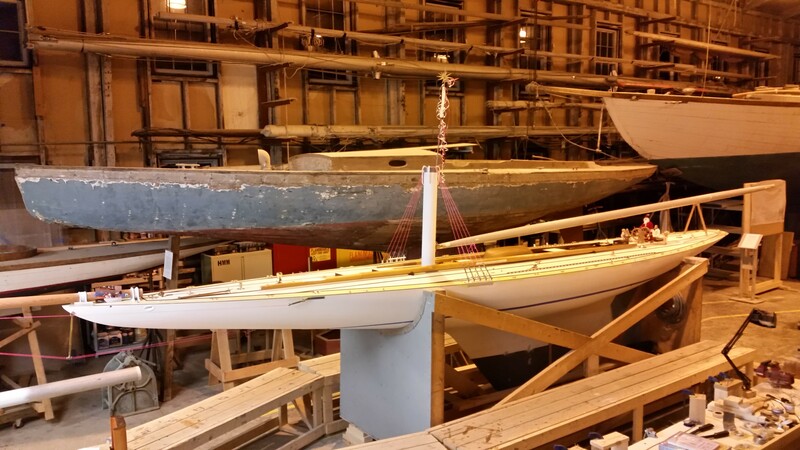 This entry was posted in Project Manager's Welcome and tagged b&w, Herreshoff, Herreshoff Marine Museum, liverpool, RELIANCE, Reliance Model, RELIANCE Project, splicing, spreader on December 18, 2014 by Herreshoff Marine Museum/America's Cup Hall of Fame. Never turn your back on our “morale officer”, Keith. He always has something up his sleeve; he probably lies awake at night thinking about puns, tricks, and displays. Last week, he took one of our GI Joes on liberty to Cape Cod, only to return with it donned in Santa garments. We’d like to thank Keith’s wife Mary Jo for making the Santa outfit. Speaking of dressing: would anyone be willing to make an outfit for Mrs. Iselin? We have a description of her sailor’s dress. Meanwhile, we’ve reach another major milestone on the project. 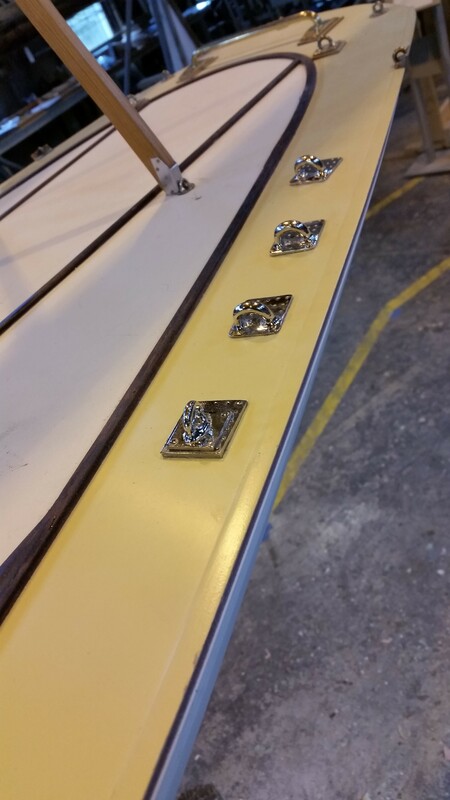 On Tuesday, we fitted the last of our deck fittings in place; our deck is essentially complete, we just some touch-up to go, which we’ll do as part of the final wrap-up. 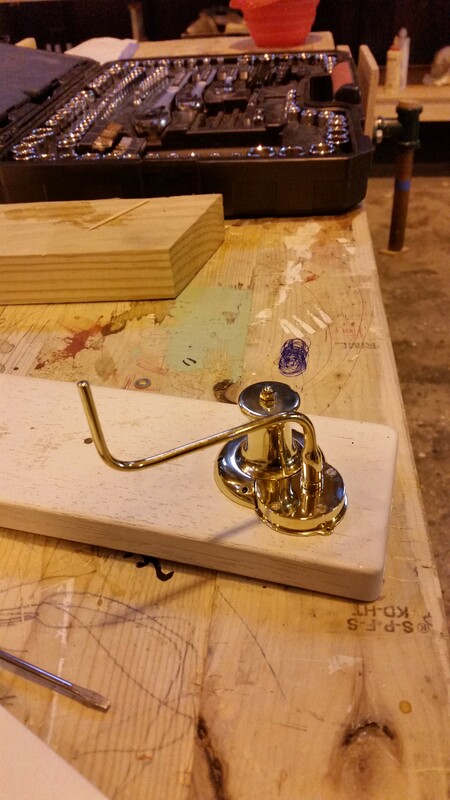 These topmast running backstay staples were some of the several items plated by R. E. Sturdy and Co. They’ve been glued, riveted, and bolted into place to ensure they can carry the load. Now we’re working at fittings for the boom and mast, the first of which has been fitted to the boom and temporarily to our stump mast. We still have some work to do on the goose neck assembly. As many of you know, RELIANCE was launched 177 days from receipt of order and delivered to the Iselin syndicate 194 days after masting, rigging, and sail testing. So, we’re about 150 scale man-days complete! 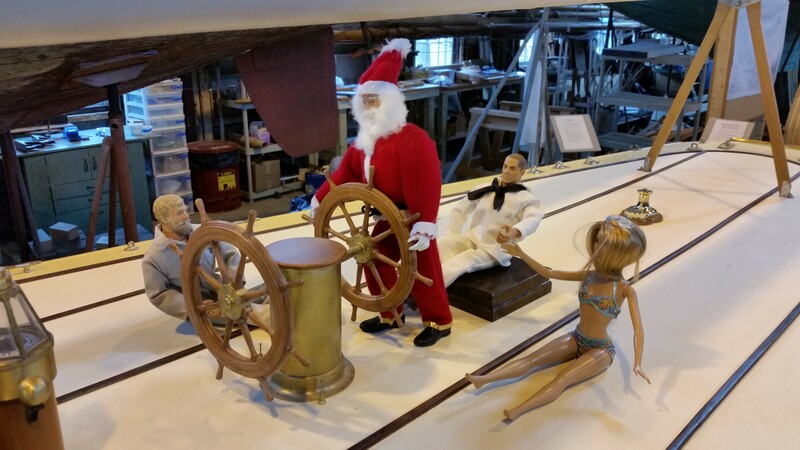 This entry was posted in Project Manager's Welcome and tagged backstay, christmas, clothing, fittings, Herreshoff, Herreshoff Marine Museum, RELIANCE, Reliance Model, RELIANCE Project on December 15, 2014 by Herreshoff Marine Museum/America's Cup Hall of Fame. After a much needed Thanksgiving break to regain energy, we’ve returned to the RELIANCE Project with some lively holiday spirit. We decked out the RELIANCE model by putting a pole star on the unfinished mast. It lights up the shop pretty nicely! 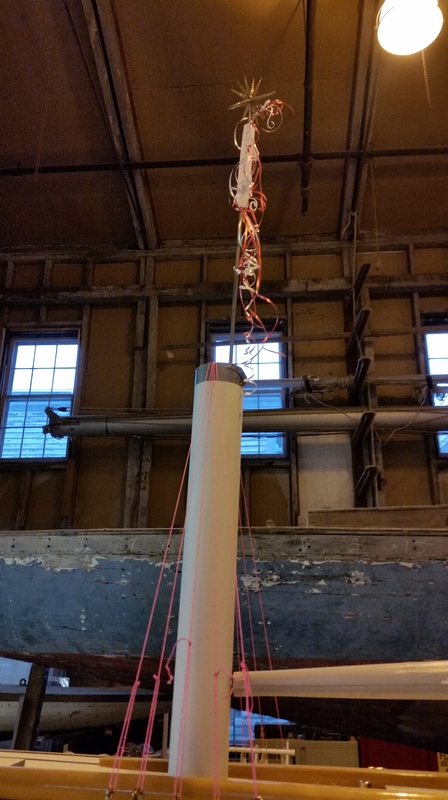 This entry was posted in Project Manager's Welcome and tagged Herreshoff, Herreshoff Marine Museum, holidays, pole light, RELIANCE, Reliance Model, RELIANCE Project on December 4, 2014 by Herreshoff Marine Museum/America's Cup Hall of Fame.